Larne-born Purplebricks founder Kenny Bruce is widely tipped to make a bid for Larne FC’s Inver Park home, after the grounds were put up for sale this week. 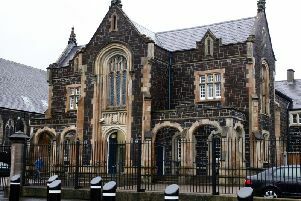 The grounds - which are owned by Mid and East Antrim Borough Council - were listed for sale by O’Connor Kennedy Turtle on Tuesday, though the asking price has not been revealed. The 4.7 acre site comprises the playing pitch, stands and ancillary accommodation of Inver Park. The subject is zoned within the Larne Area Plan as ‘white land’ and has potential due to this zoning for a wide variety of uses. However, the grounds are currently tied to a covenant prohibiting the use of the land and buildings for any other use than for sports or recreational purposes. The council will be offering the legal title for sale and the lands will be subject to a future lease being granted to a football club and further subject to the beneficial interest of a Trust Deed which applies to the lands. A spokesperson for the council said: “Mid and East Antrim Borough Council is committed to ensuring all our citizens have top class sporting facilities to enjoy throughout the borough. “In order for council to demonstrate best value on the disposal of an asset, guidance states that the asset should be put on the open market for sale. Mr Bruce made his interest in Larne FC known last summer when he took over the club and in October he outlined plans to invest in both Inver Park and the team at an engagement session with supporters. The proposed investment, understood to be a six-figure sum, was a considerable turnaround in fortunes for the club which during the summer had to temporarily close its ground due to “safety concerns”. Since then Larne FC has bought players in deals that have seen them outbid Irish League teams.